New technologies and apps have a wealth of measurements to improve our farms. We use technology so often on our farms now that I'm always left wondering what the next best things will be. 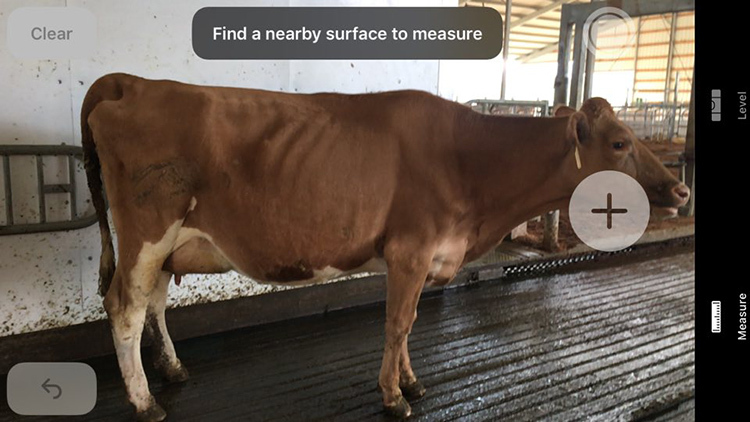 The possibilities are already out there — robotic milking, activity and rumination monitors, a smartphone in most farmers’ pockets with useful apps. It is exciting to see how technology can help improve our jobs as caretakers of these bovines. My latest update on my iPhone brought me a new app that is a measurement tool. Not going to lie, I had fun playing around with it. After we classified this past time, I got my mind thinking of how it could be put to use on the farm. For me, classification should be the collection of data that correctly portrays the type of daughter a bull produces. Classifications provide important and useful data that influence mating decisions on our farms and thus the future of our herds. We all love a beautiful cow, but the collection of the data should correlate with her measurements. Not all the scores break down exactly into a measurement. But what if we could get exact, accurate information by using technology to get those ones requiring measurements? I want to make it clear that I highly respect the men and women who take the time to be trained as classifiers. Their job is so very important, and I'm always impressed with their eye to obtain the measures they do, but there is still that human element that makes some numbers not 100 percent accurate. So is a classification app something the dairy industry needs to work on developing? Probably not the next big thing, but it's fun to wonder where technology will go next. Personally, I think technology can't and shouldn't replace the human touch of many elements of dairy farming. But if you could develop an app or put technology to use for some job on your farm, what would it be?